The Authority is governed by a 16-member Board of Commissioners. The Governor of Pennsylvania appoints six commissioners, with the Auditor General and State Treasurer of Pennsylvania serving as ex-officio commissioners for Pennsylvania. 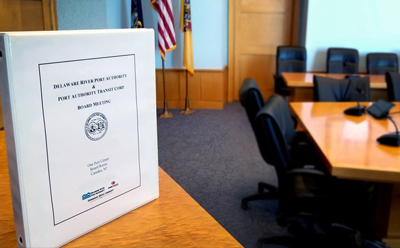 The Governor of New Jersey appoints eight commissioners with the advice and consent of the Senate of New Jersey. Commissioners serve five-year terms without compensation. The Board of Commissioners establishes policy and plans for the operations of the Authority. A Chief Executive Officer is appointed by the Board of Commissioners to implement policy and to manage the daily operations of the Authority. The DRPA Port District comprises the counties of Atlantic, Burlington, Camden, Cape May, Cumberland, Gloucester, Ocean and Salem in New Jersey and the counties of Bucks, Chester, Delaware, Montgomery and Philadelphia in Pennsylvania. Board of Commissioners hold board meetings typically on the first and third Wednesday of every month at 9 am. The meetings are open to the public and take place on the 11th floor at One Port Center.